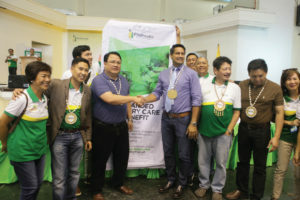 PhilHealth launched the Expanded Primary Care Benefit Package (EPCB) for the employed sector, senior citizens and the lifetime members last October 29, 2018 in Robinsons Place, Ormoc City, Leyte. PhilHealth came in full force with no less than President and CEO Dr. Roy B. Ferrer spearheading the activity together with PhilHealth senior officers and board members with the support of the PhilHealth Regional Office 8 Team. Four hundred sixty participants were on hand to witness the historic event to include health care institutions, employers and employees as well as senior citizen members. This benefit package has long been awaited especially by the members of the employed sector as well as the elderly members as this will ensure that they can avail of the much needed physical check-up. Among the benefits of the EPCB are medical consultation, laboratory or diagnostic exams, and medicines for acute gastroenteritis, urinary tract infection, upper respiratory tract infection, pneumonia (low risk), asthma, hypertension and diabetes mellitus (Type II). These can be availed of in health care facilities accredited to provide for this specific benefit. During the event, there were eight (8) health care providers awarded with Certificates of Commendation for being the first to heed the call of PhilHealth to get accredited for the provision of the EPCB services. They included Corrompido Specialty Hospital and Pudpud PolyClinic & Specialty Hospital of Sogod, Southern Leyte; Leyte Baptist Hospital of Hilongos, Leyte; Our Lady of Porziuncola Hospital and St. Camillus Hospital of Calbayog City; Samar Provincial Hospital, St. Jude Hospital of Guiuan, Eastern Samar; and St. Scholastica’s Hospital of Pambujan, Northern Samar. PhilHealth 8 Regional Vice President (RVP) Acisclo B. Militante said that “The Expanded Primary Care Benefit package is a product born out of PhilHealth’s desire to provide a holistic health assistance from preventive to curative care for its members.” On the other hand, PhilHealth Acting President and Chief Executive Officer Dr. Roy B. Ferrer said that his mandate is to improve systems, push for innovations & enhancements to the health insurance benefits, services and programs. “The EPCB empowers the members of the Formal Economy, Lifetime Members as well as Senior Citizens as it provide for diagnostic and laboratory tests,” the health insurance honcho added.